Part - Time Stock Teammate - Foley, AL at Under Armour, Inc. The Stock Teammate is responsible for maximizing selling potential by ensuring the efficient and effective flow of merchandise from the stockroom to the sales floor. The Stock Teammate is accountable for delivering on all aspects of stockroom standard operating procedures (SOP) and achieving the brand standards for shipment processing, replenishment, markdowns and merchandising. The Stock Teammate is expected to model Under Armour’s Core Competencies and I WILL behaviors in all actions and interactions in order to maintain a positive Teammate and Athlete experience. Consistently achieve brand productivity standards for shipment processing, replenishment, markdowns and merchandising through utilizing the company tools and resources. Maintain stockroom standard operating procedures (SOP) to support efficient and effective handling and placement of merchandise, visual props, marketing and fixtures in order to maximize sales and productivity. Execute efficient and effective shipment processing by following processing and placement guidelines; track and communicate units per hour productivity to store leadership. Support, understand and adhere to Under Armour’s visual standards in order to maximize merchandise presentations when flowing product from the stockroom to the sales floor. Partner with store leadership to ensure all aspects of replenishment are properly executed to include Fill the Floor, power closes, power opens and merchandise adjustments. Communicate merchandising opportunities to store leadership as identified through replenishing size specific quantities throughout the store: recommend and execute merchandising adjustments in compliance with Under Armour’s visual standards. Execute markdowns and re-ticketing in the stockroom and on the sales floor; update store leadership on compliance. Partner with store leadership to complete stock transfers and process damages. Consistently provide support to fellow teammates through sharing of knowledge, helping to complete tasks and/or assisting in customer interactions. Engage in, maintain and support safety standards on sales floor and in the stockroom; communicate safety concerns to store leadership. Aware of and follows Loss Prevention policies; advises management of any unusual internal or external activity. Strong verbal and written communication skills specifically with customers, sales leadership team and teammates. Ability to handle multiple tasks while working in a fast&dash;paced and deadline&dash;oriented environment. Ability to lift cartons weighing up to 25lbs. 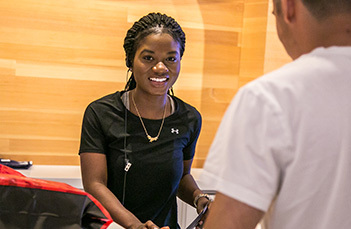 Under Armour is an Equal Opportunity Employer and we are committed to diversity in the workplace. We encourage qualified diverse candidates to apply. Under Armour does not discriminate against any candidate on the basis of race, gender, disability, religion, national origin, age, or any other protected category. Each of our locations have its own advantages. Check here to see the restaurants, schools, and more around this office. Stay ready and on top with the latest career opportunities and UA news delivered right to your inbox. This is where the underdog comes for support. Where customers can find the best gear in sports. And where everyone can find the athlete in themselves. This is where we are growing. Where we are going to build what’s next. 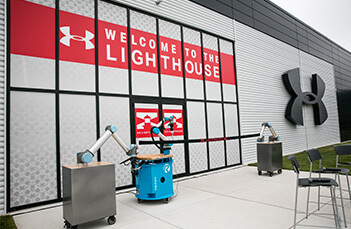 How we are making a major difference in the city that Under Armour calls home.